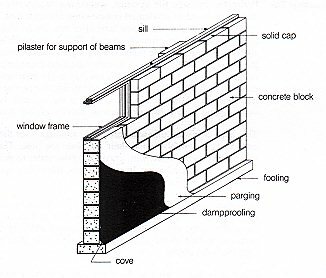 The presence of efflorescence, a whitish mineral deposit on the interior of foundation walls, indicates moisture penetration. It should be noted that the severity of the problem, or whether the problem is active, is not indicated by the amount of efflorescence. Other clues are rusty nails in baseboards, rotted wood near floor level, rusted metal feet on appliances, mold and mildew, lifted floor tiles, storage on skids, peeling paint and the presence of dehumidifiers. Sealing foundation cracks can be performed several ways with the cost of repairs varying. The approach taken depends on the specific crack; however, the most successful approach is sealing from the outside (Cost $500 – $900). Urethane or epoxy injection repairs can be done from the interior on poured concrete walls only (cost $400 – $600). 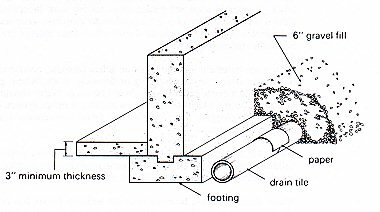 The drainage tile laid beside the footing is covered with gravel and filter paper.These tiles can often be damaged or clogged by roots and some localized repairs may be required. Because excavating on the exterior is expensive ($8,000 – $15,000 typically), an alternative is an interior drainage system. The cost of this approach is one-third to one-quarter the cost of exterior work. There are many cases where this proves satisfactory, although this must be judged on a case by case basis. Line drawings are from Carson Dunlop’s The Home Reference Book.